The UFC has announced the rest of their schedule for 2018 including the final card on FOX as well as a return to New York and Madison Square Garden. 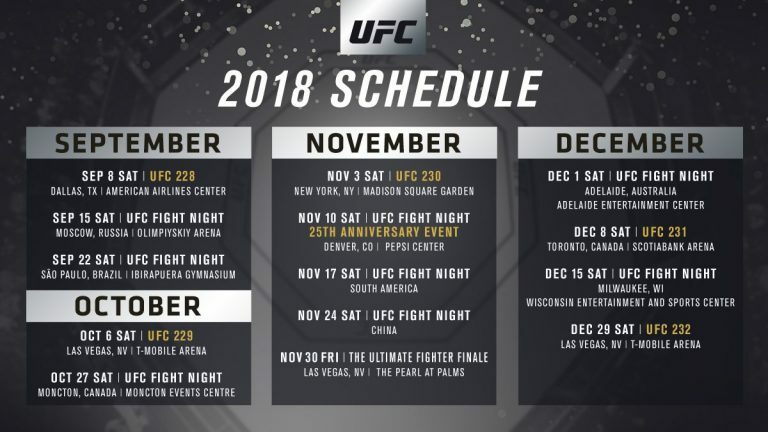 The UFC has officially announced the remaining schedule for 2018. On Saturday night during the UFC 226 broadcast, the remaining scheduled for the rest of the year was revealed including a destination for UFC 228 in September. That card will take place on Saturday, Sept. 8 from the American Airlines Center in Dallas, Texas. UFC 229 will happen on Saturday, Oct. 6 from the T-Mobile Arena in Las Vegas. 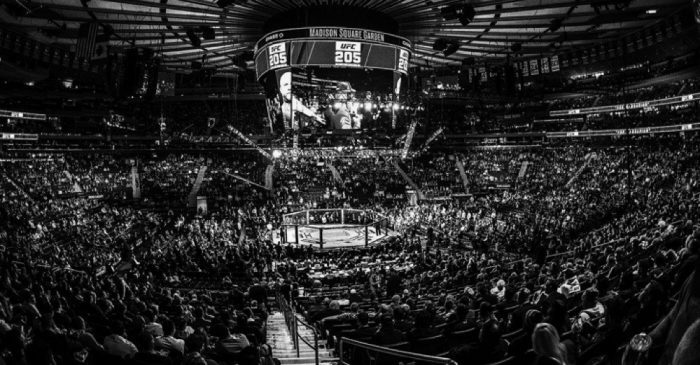 Meanwhile, UFC 230 will see the UFC return to New York City for the third straight year with a card scheduled at Madison Square Garden on Nov. 3. UFC 231 will happen on Dec. 8 from the Scotiabank Arena in Toronto while the year end card will take place on Dec. 29 as UFC 232 goes down from the T-Mobile Arena in Las Vegas. One more special note is the UFC on FOX card on Dec. 15 from Milwaukee, Wisconson that will serve as the final card for the promotion on FOX before a new television broadcast deal with ESPN starts in January 2019. Sept. 8 — UFC 228 from the American Airlines Center in Dallas, Tex. Nov. 10 — UFC Fight Night Special 25th Anniversary Card from the Pepsi Center in Denver, CO.
Dec. 29 — UFC 232 from the T-Mobile Arena in Las Vegas, NV.